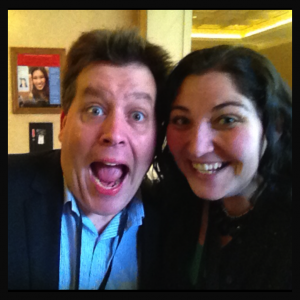 Peter Shankman In Utah – Let’s “Shank” The Love! Over the past year, I have served on the leadership board of Social Media Club of Salt Lake City. One of the fun things about being on the board is helping plan our events and guest speakers. On February 28th, we’ll be having our biggest SMCSLC event since the 2012 relaunch of the Club. Peter Shankman, the world-renown speaker, author, and entrepreneur will be the featured presenter at our February event. Peter Shankman is recognized worldwide for his radical ways of thinking about social media, marketing, public relations, advertising and customer service. Peter’s incredible expertise, quirky personality and engaging presentation style guarantee this will be an evening you don’t want to miss. He is the inventor of Help A Reporter Out, aka HARO, which allows skilled individuals offer their expertise to the media, which could help you land that big media opportunity you’ve been looking for.. When I was at New Media Expo in Vegas last month, I ran into Peter in the hallway of the Rio. I’ve met Peter before at an event, but it’s been a while. I know that he meets thousands of people a year, so I introduced myself to him as he shook my hand. He said, “Of course I remember you, Nicole.” It always impresses me when people have such a great memory of people that they have previously met…which further indicates his awesome people skills. Want to attend the event for free? I am giving away one free ticket to the event, which is a $25 value. To enter, go to my SMCSLC board member profile, and reply in the comments about something new you learned about me. The winner will be selected on February 14th at noon. For those who do not win the free ticket, you can get a $10 discount to the event. Reach out to me on Twitter (@cuteculturechic) and ask me to “Share the Shankman Love”. I will reply to you via direct message with a limited time discount code. Note: you must be following me on Twitter so I can send you the code via DM. As a committee, we’ve joked about ways to promote the event….and Shankman has always abbreviated down to “Shank,” so we’ll going to share the love….or “Shank the Love,” if you will. At our board meeting, we may or may not have made up a fun theme song to the tune of Debbie Gibson’s “Shake Your Love.” Anyone remember this song?